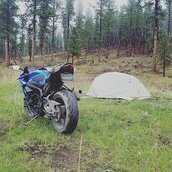 Today I saw a social media post from another big name riding school that spoke of "the importance of body position and using the lower body to steer the bike.” It made my forehead wrinkle because steering with the lower body is contradictory to everything I understand about motorcycle riding. I sometimes think I should be open to some of the "just trust me" tips from fast guys; the last thing I want to be as a student is closed-minded. But there are some things, like this lower body steering that make me skeptical. I love CSS instruction because they have so much solid data, as you said, to back up what they teach. I find it easy to do (with the front brake and throttle) on the road, but not sure my brain could cope when riding at the very limit. One of my current bikes is a 1999 Honda NT650V Deauville. I have put the rear preload on max, which raised the static ride height by 40 mm. Up front, I have raised the oil level by 5 mm to 115 mm from the top and raised the front 20 mm through extra preload. It handles like a bike much lighter than its 530 lbs wet weight would suggest - I will claim that it steers quicker with less effort than my MT07. After raising it, the 150/70-17 Michelin PR4 will erase any trace of chicken strips before anything touches down. The 110/70-17 Michelin Pilot Street front has about 3 mm of chicken strips left, at which point the short peg feelers scrape hard enough to fold the pegs noticeably upwards. Still, by looking at the tires and also judging the sensation of lean, I would say that the bike heal over satisfactorily for a street bike. However. Cornering speed is unusually low. As an example, today I went through a long sweeper with the peg feeler screeching while doing an indicated 55 mph. As a comparison, the MT07 will take the same corner at 70 with nothing touching down. Same with the GSX600F Katana I owned some years ago. In fact, I could do over 50 mph on my Intruder 1400, a bike not famous for its cornering abilities. This repeats itself around just about any type of corner. And before I upped the preload, it would scrape doing 40 around a corner my CB400SF take at 65 mph with seemingly tons in reserve, although I had reached my personal limit. Finally, the question; what in your opinion could be causing this bike to lean far and corner slow? The overlapping can only be with the rear brake. All flat track and cross riders use it extensively to maximize chassis stability and the traction/power delay is higher than on sport bikes. I can't begin to imagine how to overlap the front brake lever and the throttle. I agree with this 100%. While it is sort of an interesting theoretical discussion, it would seem exceedingly difficult to apply in practice. the difference in ginkana technique is that the max lean is obtained at low speed ? i'm right? Anyone watch motoGP? Sometimes they have onboard video with lean/throttle/brake overlay. I watch those very carefully, never once seen an overlap between braking and throttle. Not even when Rossi rides (because there are rumors he applies this technique of brakes and gas at the same time) I have data from Xavi Vierge and he doesn't do it either. In theory I could understand the concept but the "juice is not worth the squeeze". It's too distracting, and it could take away from your sensitivity on the brake lever if you are also trying to apply 5% throttle. If you are not at the limit, and not going fast, you don't need sensitivity on the brake lever because you won't be using it anyway at high lean angles right? So when you get faster, you will find yourself with some light brakes at 48 deg lean, and if you press just a tiny bit more on the lever, your front end will close. It's a combination of camber thrust and steering angle. At a 45 degree lean angle, the profile of the tire generates alot of camber thrust, like when you roll a cone on the ground, it rolls in circles. Camber thrust at 45 degrees makes the bike want to turn at a radius of about 5 - 10 feet depending on your specific tire profile. This radius is much less of a radius we negotiate at the track. This is why we can have situations where the front wheel is actually pointing towards the outside of the turn during cornering rather than the inside. That is because camber thrust is TOO large. without a rider on a bike, if it leans to 45 degrees at 100 meter radius is 112km/h If you add a rider and rider is sitting on bike in the center same condition. 45 deg, 100m 112km/h If rider is hanging off, 2 things can happen: 1) bike is leaning 43 degrees 100 meter radius 112km/h (contact patch to center of gravity angle is now 45 deg) 2) bike is still leaning 45 deg 100 meter radius ~120km/h (contact patch to center of gravity angle is now 47 deg) Hanging off the bike reduces bike lean angle, so suspension works more efficiently and you gain more mechanical grip regardless of the coefficient of friction of your tire. If you hang off the bike alot, you reduce the effect of camber thrust, and your front tire will have to turn more into the corner. If you are a beginner rider, you do not need to hang off the bike because you don't need the extra 1% suspension effectiveness. A bike doesn't fall because the steering rack can turn. It's not the rotating mass of the wheels. If you weld your steering column so the front wheel cannot turn, your bike will fall. quote from tony foale book: 2-20 Tyres Camber force (thrust) The previous section explains how steering a wheel generates the force necessary to force a vehicle to turn around a bend. However, bicycles and motorcycles must lean when taking a corner and this leaning also creates a lateral cornering force. In fact at all but the slowest of speeds and cornering accelerations this force will likely be the major contributor to the total cornering force, and the steering effects will just make up for the difference between the required cornering force and that provided by the lean. Hence, the degree of steering necessary on a motorcycle is much less than that required by a car. The lateral tyre force due to the tyre camber angle is known as camber thrust or camber force. Let’s look at Fig. 2.18 to see how this force is created. Fig. 2.18 The top left sketch shows how the contact patch of the tyre flattens at an angle and effectively becomes a slice of a cone which tends to turn around the geometric apex of the cone. The other two diagrams show how this cone tries to turn a tighter circle than the actual bend radius. As the inside edge of the tyre is forced to adopt a smaller radius than the outer edge, then for a given wheel rotational speed, the inner edge would prefer to travel at a slower road speed, this happens if the wheel is allowed to turn about a vertical axis through the apex of the cone. Just as a solid cone on a table would, if given a push. If the bike was leaning over at 45° then for a normal size tyre the horizontal radius to the cone axis would be approximately 450 mm, an impossibly tight turn. However, we’ve seen before that Conservation of Momentum will want to make the bike go straight which tends to work against this desire to turn about the effective cone centre, these conflicting effects will form a balance where the actual corner radius described is considerably greater than the cone radius. A motorcycle is a series of gyroscopes. Gyroscopes resist changes in planes of motion and exert forces at 90degrees the plane of rotation. These gyroscopes are what keeps the bike in balance and it is the interaction of the forces along with the subtleties abovementioned that make what you observe. It’s why a rider cannot “muscle” a bike to do his/her bidding; it must be asked according to laws of kinematics. you have done the perfect abstract of what i learned in last times. but the perplessity is on what makes the bike turn the same but with less lean. Great question! To negotiate a bend (corner) we want to turn the bike. That’s our goal, objective or purpose. To accomplish this, one of the things we do as a prerequisite (thing we do beforehand) is we lean the bike. The countersteer and relax of input at the handlebars establishes the lean angle. To make the bike turn, the wheel turns slightly into the direction of the corner. Depending upon many things (speed, road surface and type, tire size differential, throttle application, etc) the amount the front wheel turns gives us the turn radius that gets us through the corner. The art and skill of the rider in applying known inputs a predictable amount will determine if we get through the corner effectively or not as effectively. The main advantage I see is pre-loading the rear sprocket, chain and rear suspension while the chassis is still pitching nose down due to deceleration. The rear suspension remains more or less extended during the transition, rather than returning to normal after prior getting extended again under power. The top leg of the chain is slacking while braking and the transition to power always has a shaking effect, plus some dead rotation of the sprocket (if some play exists between the rear sprocket and rubber connectors to the wheel). That transition used to be less abrupt for carburated bikes than it is for the ones equipped with fuel injection (there is a time lapse after control input). For street riding, it is safe to use the rear brake for that purpose, rather than simultaneously manipulating the throttle and front brake controls in a fine manner. A major problem with the Hit Air is that it doesn't cover the side of the shoulders (first hand experience resulting in a shoulder separation). As noted in the previous posts is also bulkier, you have to remember to clip it before each session race and it is not really cheap: half the time the textile shreds after impact and you have to replace it with a new one. I rather save money in bike parts than in a suit airbag. Picking up the throttle slightly at the end of the trail braking loads the rear tire and helps to stabilize the rear grip before accelerating. Like you wrote, overlapping the two controls also stabilizes the chassis on the transition. Of course there is a difference between picking up the gas slightly and cracking up the throttle when you are at lean.